Sci-fi is not one of my favourite genres; I should say that up front. 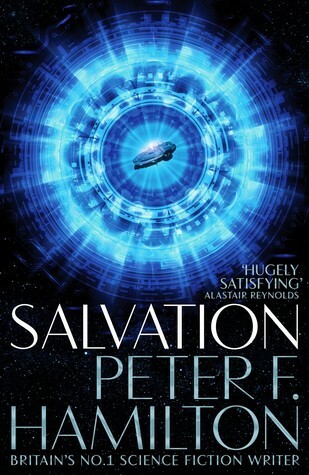 However, I had a little free time, so when I received a copy of Salvation, I decided to give it a shot. Overall, I don't think it was a waste. I am often put off sci-fi because of all the hard science that doesn't mean much to me. This book was a blessing since such moments were only included here and there, and never for too long, with most of the focus on the plot and characters. The premise of the tale was certainly intriguing, the world building was well done, and I appreciated the many-timeline narrative, which revealed information here and then until we had built a complete picture by the end. The only downside to this approach was that, aside from Dellian, and maybe Callum, I didn't feel that I spent long enough with any of the characters to get to know them fully. Each had a side story to share, but some were more engaging than others. I finished the book with the sense that I would be interested to know what will happen in book two, if the opportunity to read it arises. However, if I don't end up reading on, I won't be too downcast. As such, I am giving it 3.5-4 stars, with the proviso that a true sci-fi fan will probably get more out of it than I did. I didn't dislike it in any major way; it simply didn't grab me.